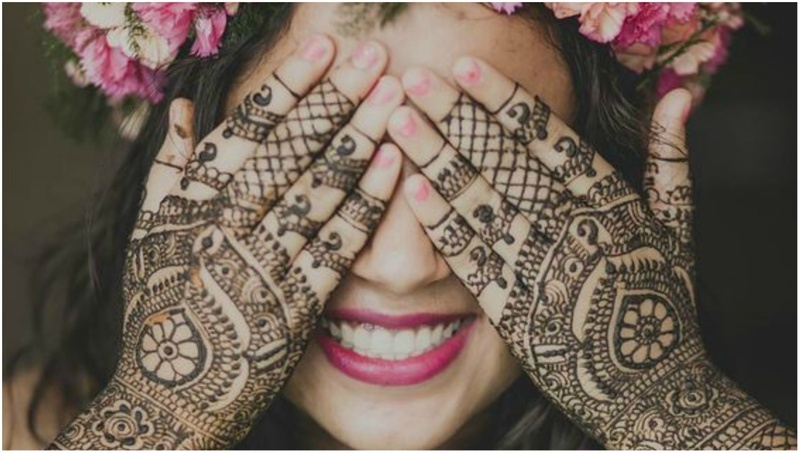 10+ Offbeat Mehendi Designs We Spotted On Real Brides! You are a modern day bride & your mehendi design should put across the same message, shouldn’t it? So we went through a LOT of mehendi pics to see if brides are opting for something more creative & unique these days and the results were pleasantly surprising! More and more brides are now blending traditional designs with quirky, contemporary elements, bringing out the cool side of them in their henna designs! There were a few who opted for totally offbeat mehendi patterns that are different, gorgeous and perfect for a modern 2018 bride! London Eye and London Bridge hold a very special place in Masoom Minawala's heart as that's the place where Shailin, her now-husband, proposed to her, and she incorporated the same in her mehendi! This bride got a picture of her dog BFF as a part of her mehndi design and we just can’t adoring the cute little puppy in it! The design is pretty close to reality, isn’t it? This is such a cool way of wearing jewellery - get your mehendi in the design of a bracelet or an anklet. It might also mean completely doing away with real jewellery so as to not overshadow these striking patterns. Now, this bride opted for some realllyy cute & intricate details of a few moments between her and her fiance including the Starbucks coffee, music notes, sunflowers and a moustache. How cute! Look at this one - This bride’s fiance is a pilot and so she incorporated some really pretty aeroplane motifs in her mehendi design! Sometimes less is more and these minimalistic henna designs completely prove so! These designs are nothing more than delicate tattoos on fingers, a single vine at the back of the hand or elegant swirls around their wrists but definitely make a sight for sore eyes! Checkered design has been in trend for quite sometime now and they still make for a great henna design! You can balance out your intricate and complex mehendi pattern with a simple checkered design to make it really eye catching! It’s a very popular yet age old tradition of hiding the groom’s name inside the intricate mehendi pattern. This trend being a little jaded right now, you can also opt for including your wedding hashtag in your mehendi design. This bride's unique Mehendi design has her entire baraat and doli scene making it look totally awesome! Getting the henna design done on your feet is just so passe. These brides decided to have the mehendi design done on the sole of their feet and the results are just ah-mazing! Brides are constantly taking their mehendi game up a notch with the upcoming wedding season and these delicate designs on the back are nothing less than stunning! We are sure by now you have decided which design you are going to get and where! Whatever you do, just pick a design that’s totally you!